This is obvious that when you have landed on this blog, you are already in search of a dissertation abstract writing example, aren’t you? So, now you search is finally over, as My Assignment Services UK would provide you the example you have been searching for. Though, abstract is brief, yet it a comprehensive and detailed summary of your research. Or in other words, an abstract is a descriptive summary in your dissertations, which is no longer than 350 words. 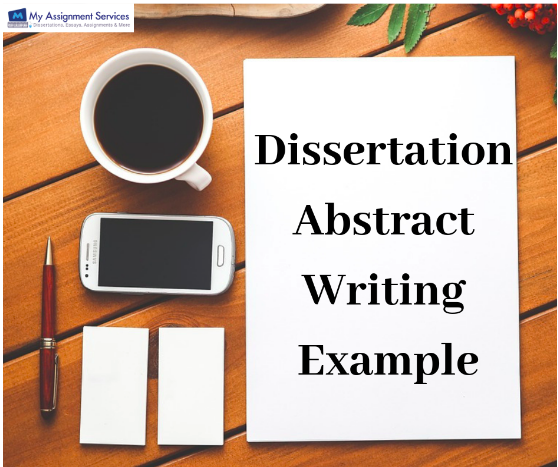 So, in this blog, our dissertation abstract writing help experts would take you around all the aspects with the help of an example, which might come handy for you, when you write your abstracts. So, whenever our dissertation help experts prepare a reference dissertation abstract writing example for you, they make sure that their abstract cater to these parts. Now, here we present the sample dissertation abstract which we have been discussing about. To let you know and make your concepts about an abstract clearer, below is an example written by the experts of our dissertation writing services. Make sure you go through this, so that the next time you start writing the abstract for dissertation, you dont face any issue. In addition to the afore-mentioned three parts, there are several other things which must be included in your abstracts. You can very well see in the above dissertation abstract writing example that the other sections are marked. These include the background statement, narrowing statement, elaboration, aim, focus of aim, elaboration of aim, evaluation of results, limitations and recommendation for future study. As discussed, this section has to be very short, yet effective as it gives the detailed summary of the dissertation. So, in order to do this section, our dissertation abstract writing help experts make sure that the title and the author’s name of this abstract document is same as it appears to be on the title as well as on the approval page. Also, this abstract is written in sentence-style capitalisation. Also, in this dissertation abstract writing example, it is well evident how all the information about the dissertation has been elaborated, but articulately. In addition to this, there are 2 kinds of abstracts which are used in dissertations nowadays, such as the descriptive abstracts and informative abstracts. While, a descriptive one simply talks about the work, without any judgements or conclusion, informative one consists of judgement, analysis, conclusion, recommendations. The dissertation abstract writing example which the experts of our dissertation writing services have written here is an informative abstract. Now, the format of your abstract would solely depend on the work which is being abstracted by you. As we have discussed the main sections in an abstract, let us see how our dissertation help experts formulate those in order. Whenever, you draft your dissertation, make sure to keep this following key process in your mind. Any academic piece of writing which you write has got some purpose behind it, right? So, just like our dissertation abstract writing help experts make sure to understand the purpose of the research, before they draft the abstract, you must do the same. Only when you address the purpose of your research in your abstract, you would be able to provide credibility to your abstract. Now, whenever you write your dissertation abstract writing example, you must be efficiently able to cater to the problem which your work would be addressing to. You must be aware of the scope and the target audience, in order to write the main arguments, thesis and claims. Obviously, your abstract would contain a lot of models or approaches which are useful in larger scope. Realising this, your abstract must have the types of evidences which you would be using in the abstract. 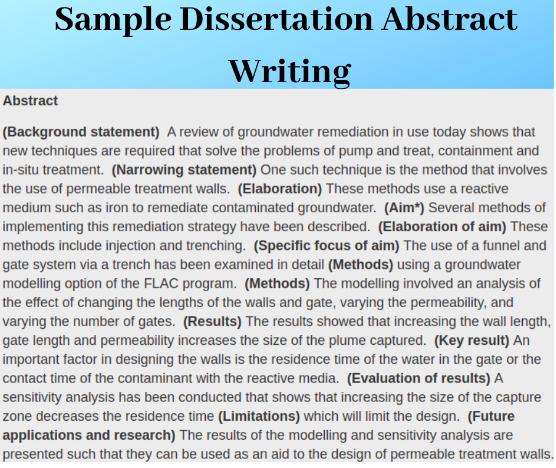 Just like our dissertation help experts have used the groundwater modelling in their example, you must ensure that you too incorporate some or the other models. In addition to various models or approaches, your abstract must also be inclusive of specific data that would indicate the result. However, if your dissertation is a qualitative work, then you can discuss the general finding under this section, just like we have done in our dissertation abstract writing example. In this last and final section, your abstract must reflect the changes that you want to be implemented based on the results. You must also talk about how this implication would affect the future course of study. My Assignment Services UK is a one-stop destination for all you dissertation writers, where you can get assistance for all the aspects of dissertations, such as conclusion, introduction, and many others. If you need us, anytime of the day, you can contact us via the order now form.